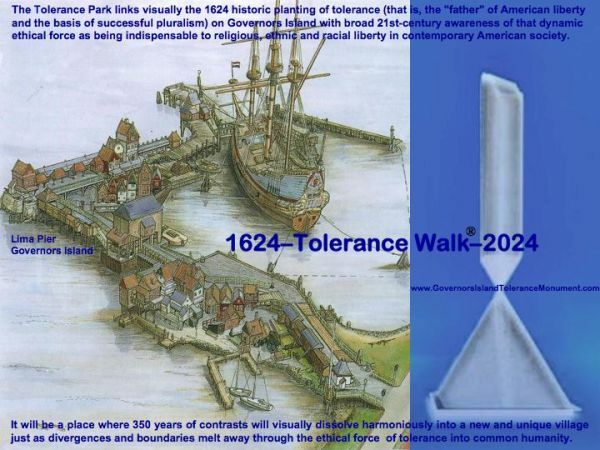 The Tolerance Park restores Governors Island to its rightful historical importance as New York State's birthplace and extols America's vital role in advancing liberty in the world through the moral force of Tolerance as a reciprocal dynamic. It is the spot on which the juridical principle of [religious] Tolerance - the founding tenet from which liberty springs - took hold in the New World in 1624 and where 350 years of contrasts visually dissolve harmoniously into a new and unique village, just as divergences and boundaries melt away through the ethical force of tolerance into common humanity. The GovIsland Tolerance Monument is the tableau's thematic focal point. Visitors arriving via Governors Island's Lima Pier can board the anchored 17th-century exhibition ship "Servitude." The Tolerance Walk takes them alongside exposition and performance spaces to blockbuster exhibitions in the Tolerance Monument. Throughout the Governors Island Park-to-Tolerance canvas, art is infused occasionally with spectacle. Guests experience commercial and artistic endeavors including music, visual, theater, performance, film, video and participatory arts along the dynamic themes of reciprocality with respect to religious, ethnic and racial tolerance. All artistic projects and programming along the ethos of tolerance endeavor to collaborate with exceptional national and international institutions. They are meant to engage the audiences intellectually as well as to be inspirational which can be captivating, uplifting or joyful edutainment such as, for example, the musical that celebrates racial and religious tolerance - Ana Frank, Un Canto a la Vida - by the Spanish writer and producer Rafael Alvero, or the opera that fosters understanding of shared history - Amistad - by the American composer Anthony Davis or Alfred Uhry's play Driving Miss Daisy in which Martin Luther King and Southern segregation are resonating. CLICK HERE for position of Lima Pier in the Tolerance Park on Governors Island. CLICK HERE to find out how the jurisprudence of freedom of conscience and religious tolerance arrived into the New World on Governors Island in 1624. To join, please go to www.GovernorsIslandToleranceMonument.com, click the Petition button and type your name and email address. The New World's first lawful expression of freedom of conscience and religious tolerance (toleration) as an individual liberty took place in 1624 on Governors Island - New York State's officially recognized birthplace. This historic precept of toleration was optimized to freedom of religion in the First Amendment of the Bill of Rights of 1791 by promising all religions to be equal and free under the United States Constitution. State rights, however, continued to displace the Constitution in the matter until 1868 when also freedom from religion was achieved for all U.S. citizens: "No State shall make or enforce any law which shall abridge the priviliges or immunities of citizens of the United States." Therefore, as of that year, civil law in religious matters superseded religious laws, practices and conduct which had been protected by assorted states. It finally rendered effective the founding of the United States of America as a secular nation: "Congress shall make no law respecting an establishment of religion, or prohibiting the free exercise thereof." This judicial liberty of freedom of conscience and toleration without discrimination, albeit with preference, of the year 1624 - codified again as New York State law in 1777 without preference - became available thus, 244 years later, to all United States citizens in the 14th Amendment of the Bill of Rights in 1868. That this active judicial notion of toleration involved mutual respect can be deduced from instructions to the colonists of 1624 to Governors Island that they were to respect the consciences of others - that is, natives and non-believers didn't have to submit to the settlers' religion (i.e., freedom from religion as in the First Amendment.) The policy was to try ‘to attract' them 'through attitude and by example' only. On the other hand, natives and non-believers, when falling under the settlers' immediate authority, could be induced by the Director and his Council to respect the colonists' faith when expressly slandered only. Religious conversion, however, couldn't be forced on anyone. But more importantly, no one could be persecuted because of religion. "A Government Of Performance, Integrity And Pride"
The 1624 Governors Island landing delivered New York State's oldest laws and ordinances from the Dutch Republic, including the juridical rights to religious tolerance and freedom of conscience which applied to what is now the NY Tri-State region between 38 and 42 degrees latitude. They imbued the Island with what today is still a universal value of historic substance and 21st-century pertinence. That these oldest laws uniquely affected New York's culture and jurisprudence is inarguable. The Island's symbolic value to America's citizens, if not humanity at large, is unquestionable. Yet, since 1997, New York State Legislators and the Governor have ignored the critical role Governors Island played in 1624 in the founding of the State of New York and the State's juridical contribution to America's culture of freedom - the State's birthright - while implicitly dignifying a faulty history as insisted upon for years by the National Park Service, the Battery Conservancy, the Governors Island Preservation and Education Corporation ("GIPEC' - a State agency) and, since April 2010, its succesor entity, the Trust for Governors Island (a City agency), on their web sites. After innumerable attempts at discombobulated, politically fragmented plans devoid of any coherence, vision or meaningful substance, and mindlessly throwing away $350,000 of tax monies to an unworkable and unattainable identity project proposed by a downtown real estate holder, GIPEC - entrusted with the development of the Island since 2003 - presented its last plan to the public in 2009. GIPEC was thus able to avoid being held accountable for rejecting the State's historic, fundamental tenet of Tolerance as the founding principle of American liberty which had been delivered first into the New World onto the State's birthplace - Governors Island - in 1624. This also enabled GIPEC to circumvent, in its development plans, NY State's primary history as started by New York's first settlers to the Island. GIPEC's plan called for a generic park made of recycled materials and had chosen its latest straw man, the architectural firm of "West8," to lead that project. The anticipated park is historically irrelevant, economically unfeasible, financially unsustainable and has no meaning whatsoever to the nation, New York State and New York City. Additionally, West8's promulgated mandate had been conditioned upon the omission of any reference to the Island's profound historical importance and national symbolic value respecting American liberty. Furthermore, in December 2008, GIPEC had started to solicit ideas from the public (!) for the naming of a section of the proposed park on Governors Island without ever having recognized or considered State Legislative Resolutions No. 5476 and No. 2708 of May 2002 which affirm the Island as the birthplace of New York State and the origin of American [religious] tolerance or toleration. The "winning entry" was Picnic Point so that in September 2009 a few [official] visitors and their guests could have a picnic and party during a New Island Festival within a New York City Harbor Festival. These festivals were the highlight of a 2009 quadricentennial celebration in honor of three legendary dead men: the American Robert Fulton, the Frenchman Samuel de Champlain and the Englishman Henry Hudson. These parties had been called into being by the New York State Legislature to generate broad popular excitement and to mobilize the State's population in celebrating the 2009 year!!! In the absence of the New York State Legislature's unequivocal acceptance of this fundamental American history with respect to Governors Island, the National Park Service, which has jurisdiction over a portion of the Island, also has been unwilling to accept the Island's and, hence, the State's legacy of toleration as the basis for ethnic diversity and central to American freedom. One may conclude, like The Tolerance Park Foundation, that the current state of affairs, wherein Governors Island is denied politically its irrefutable place in primary American history as a national symbol and as the historical locus of a profoundly momentous message which has been recognized by the United States in its Constitution and by the United Nations in Article 26-2 of its 1948 Universal Declaration of Human Rights: "Education...shall promote...tolerance...among all nations, racial or religious groups," is indeed misfortunate; although not irretrievable. The Trust for Governors Island should respect the reason for the federal government's transfer of the Island to the State of New York for one dollar past the Congressional legal deadline of September 2001. This was feasible thanks to the White House dedicating the Island to the theme of education on April 1, 2002, based on legal precedent going back to 1785. It ensured the furthering of our Preservation and Education Project. It also reduced the influence of some powerful local special constituents in the Island's redevelopment and safeguarded America's oldest natural symbol with a historic message of profound meaning to American freedom. Additionally, short of designating or preconditioning acreage for the proposed Governors Island Park-to-Tolerance project, 60-plus acres were set aside generically as "park" land upon jurisdictional transfer from federal ownership to NY State ownership on February 1, 2003. The American people thus surrendered the Island's "national economic value" to New York State and, specifically, imparted the Island's "national intangible value" to the people of the State of New York. For the Trust, therefore, to appropriate the Island's national economic and intangible values for "unique public programs, an ambitious park and a public space plan...for the people of the City of New York" is not according to the letter and spirit of the original education dedication as justification for the one dollar transfer in the national public interest or for the national common good. Ergo, it specifically denies the Island its momentous national and NY State legacy of historical substance and symbolism for America's future generations. Would or could the United States, New York State and New York City find it of any importance that, at the very least on their web sites, with respect to Governors Island's development, some reference exists to the nation's primary history of current and enduring relevance which is New York State's birthright, New York City's identity and Governors Island's legacy to American liberty as we understand it (click Governors Island National Symbol)?